It’s very common to hear the terms “dementia” and “Alzheimer’s” used interchangeably. However, they’re not the same thing, and in terms of understanding their treatment and management, it’s important to know the difference. Here's some information to better understand the difference. “Dementia isn't a specific disease. Instead, dementia describes a group of symptoms affecting memory, thinking, and social abilities severely enough to interfere with daily functioning," according to Mayo Clinic. It's important to note that although dementia typically includes memory loss, there are a lot more conditions that cause memory loss. 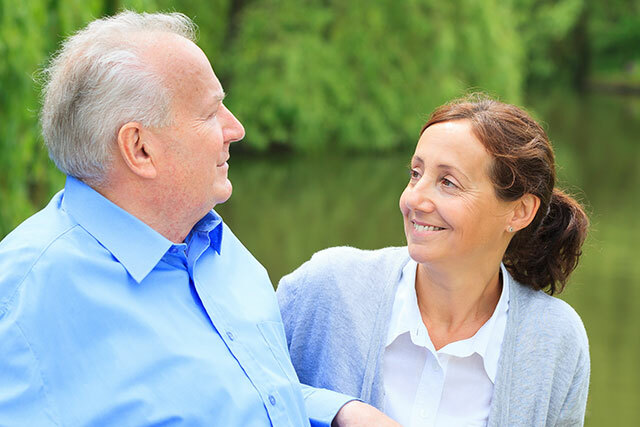 Types of dementias include Vascular, Lewy Body, Frontotemporal, Parkinson's, and Alzheimer's. “Alzheimer's Disease is the most common cause of dementia," as defined by the Alzheimer's Association. It accounts for 60%-80% of all cases of dementia. Alzheimer’s is a progressive disease that worsens over time. Initially, the symptoms may be subtle: forgetting where you put an item, to attend a scheduled activity, or how to complete familiar tasks. "Alzheimer’s patients may not remember what they did yesterday or recall what they ate for breakfast,” says Susan, national health services director at The Goodman Group. Those tend to be minor symptoms that occur early on. As Alzheimer’s progresses, however, the symptoms become more severe. “They may get lost doing usual things, are no longer able to pay their bills by themselves, or may leave something on the stove,” she says. Eventually, a person with Alzheimer’s will need special assistance and care. As their caregiver, it's important that you practice patience and empathy as well as finding new ways to communicate if they are struggling. Unfortunately, there is no cure for Alzheimer's and no way to prevent it. However, there are ways to alleviate symptoms, which helps slow the progression of Alzheimer's. Turn the stove off after cooking. The TV remote is located (fill in the blank). Take X, Y, Z medications at (fill in the blank) a.m./p.m. Brush your teeth and wash your hair at (fill in the blank) a.m./p.m. It's also helpful if caretakers set aside outfits for each day of the week versus tops here and pants there. Nothing may be more important than exercise, a nutritious diet, and challenging one's mind (by completing puzzles of some kind). Encourage your loved one to take daily walks and exercise their arms, legs, and core as much as possible. Then, fuel that strong body with plenty of fruits, vegetables, and water. Because Alzheimer's heavily impacts the brain, it's vital to keep your loved one's mind engaged every day. Complete puzzles together, help them challenge themselves mentally as frequently as you can. An early diagnosis can help, too. There are medications that can slow the progression of Alzheimer’s and other forms of dementia. So, if you’re observing early symptoms of what could be a form of dementia, it’s best to visit your doctor as soon as possible. There is also genetic testing that can tell you if you carry a gene that indicates you're more susceptible to getting Alzheimer's. Although this can be helpful, Alzheimer's is only 5% familial and 95% random, according to Susan. It's important not to focus all your attention on one form of alleviation but to work through a variety of them each and every day. The more engaged your loved one's mind and body are, the better their symptoms can be.